Neck pain from pressure on forehead is a highly specific symptomatic complaint that involves discomfort when force is applied by pushing on the brow. In essence, when pressure is applied to the front of the forehead, inwards towards the back of the head, the patient will experience pain in the cervical spinal region. To clarify this particular symptom set, the head is not moved upwards, downwards or side to side by the pressure. Instead, the neck muscles will naturally resist the inwards pressure, causing the patient great discomfort and other possible neurological expressions, as well. Gentle pressure on the forehead is a normal part of most physical examinations for back and neck pain, especially when conducted by a neurologist. This aspect of the exam can help to isolate what circumstances create pain, as well as which anatomical structures are involved in the complaint. We receive many letters from patients who have neck pain, but never realized how much it hurt when inwards pressure is applied to their forehead until they visited their neurologist for diagnostic evaluation. The sensitivity of these symptoms worries many patients enough to seek out answers for why they occur. In this essay, we will detail the reasons explaining pain due to force applied inwards on the brow. 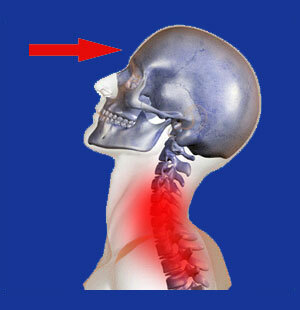 The primary complaint of this particular pain syndrome is great discomfort when the head is pressed inwards. The neck muscles will resist the force applied and this resistance will cause pain ranging from minor to extreme. Typically, the pain will exist between the apex of the cervical curvature near C4/C5 to the base of the neck and even down into the cervicothoracic frontier region. The pain is virtually always centered on the spine, but some patients might demonstrate off-center bilateral pain or predominantly single-sided symptoms. Patients with minor pain are usually not greatly distressed by their body’s reaction to the inward pressure. However, many patients are unprepared to experience such pain and almost panic at its severity. This is particular true for patients who are unaware that this motion will cause such discomfort and find out the hard way during a medical exam. It is for this reason that physicians performing this exam should apply measured force carefully until they gauge the patient’s reaction. Too much force applied quickly can terrify the patient, cause them to clench up and may even send their neck muscles into spasm. Many patients, especially those with severe pain, will also experience neurological expressions from the application of inward pressure on the brow. They might experience tingling, particularly after the immediate pain fades, followed by a feeling of weakness in the neck muscles. In fact, it is this feeling of weakness that is so frightening, since patients now realize that they can not adequately defend the slight force applied and worry about the ramifications of this fact. When the head is pressed towards the dorsal side of the body, the neck muscles will naturally and instinctively attempt to resist the force. Most patients with this specific pain syndrome will feel unable to adequately defend the pressure exerted on their brow and will experience discomfort to varying degrees. The cause of these symptoms can be neurological or muscular in nature. Typically, neurologists who perform this exam in order to elicit a response do so in order to test the innervation of the neck region and specific muscle groups contained therein. They might be evaluating suspected central spinal stenosis or foraminal stenosis in the cervical region. They might also be checking the range of motion and pain response for suspected facet joint syndrome in the neck. Muscular causes are very prevalent, with strain, serious injury and imbalance all being possible explanations for inward pressure-related neck pain. Strain or recurrent strain (RSI) can weaken the neck muscles, making them painful during specific tasks, such as the effort required to resist inward force applied to the brow. More severe injury to the neck muscles might involve larger rips in the tissues or even complete detachments that might require surgical intervention to correct. Muscular imbalances can cause the neck muscles to become short and tight or overly long and weak. Either expression, taken to the extreme, can create this exact type of pain profile, since the neck muscles will not be able to work properly or through a typical range of motion. Regional ischemia can be the root cause of muscular or neurological issues, rather than any type of actual injury or degeneration. If the neck muscles or the nerves that innervate them are deprived of oxygen, pain, tingling and weakness will surely follow. Typically, the best and most accurate diagnostic process will be completed through the joint efforts of a neurologist and physical therapist in order to evaluate all possible causative mechanisms. I personally suffered from this symptom for a period of almost 2 years and periodically afterwards, as well. I realize that my pain is muscular in nature, and is likely related to tension that is chronically held in the neck musculature. However, ascertaining this was not easy, since every disc in my neck is herniated and one directly at the epicenter of pain is largely impinging on the spinal cord. This made the entire diagnostic evaluation quite frightening, but I managed to put it all in perspective and move forward. Although I recommend getting second opinions on virtually all back and neck pain problems, in this case, I wholeheartedly advise it. There are simply far too many opportunities for subjectivity to work their way into the diagnostic verdict, often placing the patient on the wrong path towards successful treatment. In fact, this symptom often begins the process of herding patients towards unnecessary surgery. My advice is certainly to consult with a spinal neurologist and a physical therapist who are not associates. Get their objective opinions and even consider consulting an orthopedist if spinal stenosis and/or facet syndrome are suggested as possible causations. In our experience here at The Cure Back Pain Network, we find that virtually all of these types of pressure-related pain syndromes will resolve on their own if allowed time and proper circumstances to heal. 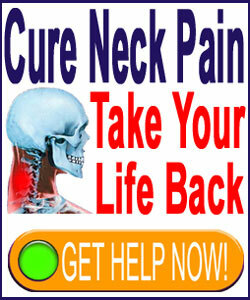 Mine is cured and few patients demonstrate the degree of structural deterioration that I do in my neck.